Tonight we reviewed the part of Musa’s (a) story where he encounters his brother Harun (a) again in Egypt. We learned that although prophet Musa (a) had asked Allah (s) for a helper he wasn’t sure that his brother would welcome him and help him with his mission. I asked my son if he would help his brother with such a task and he said yes he would. It is good to know that even an ordinary child would be willing to help their siblings with a great burden. This story also made me think of all the times that a sibling dropped whatever they were doing and came to help me and of the times I was able to return the favour. These are nice memories to reflect on. 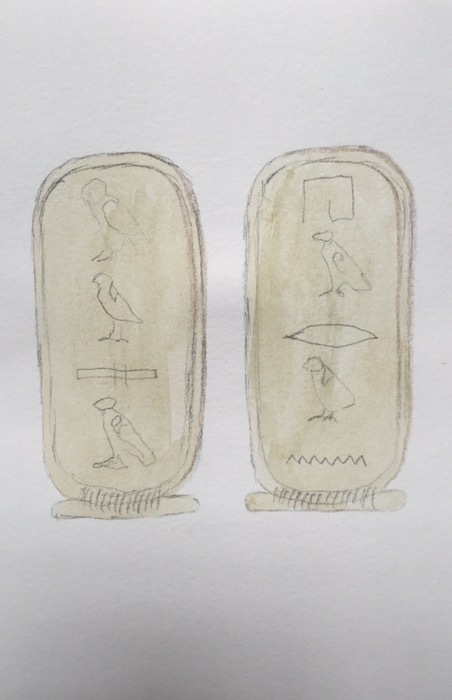 Image: for this episode I put the names Musa (a) and Harun (a) in heiroglyphics together. My son had fun comparing this to our earlier episode that had the cartouche for Musa (a) so that he could tell which was which. These names are not intended to be accurate since I do not know if the heiroglyphic spelling is at all correct. I am thinking to make my sons names in heiroglyphics with them for this project one day inshallah.